In March of 2015, I had the honor of delivering a presentation to a group of people attending a Ladies’ Tea sponsored by the New Providence, New Jersey Diversity Club in celebration of Women’s History Month. I chose to write about the first five female FBI Special Agents. These five women are true female trailblazers in the world of federal law enforcement. I stopped at five because I needed a finite group of females to highlight and because this number fit well with the timeline of the earliest females in the ranks of Special Agents at the FBI. This number also made sense to me because of the machinations of legendary FBI Director J. Edgar Hoover. Hoover created the premier federal law enforcement agency in the country, but he was resolute in his views on females as Special Agents. The first two female Special Agents, Alaska Donovan and Jesse Duckstein, were hired by Hoover’s predecessor, Director William Burns, in the early 1920’s. They both retired two weeks after Hoover was appointed FBI Director in 1924. A mystery occurred in late 1924, when Hoover appointed Lenore Houston as a Special Agent. She was the first, last, and only female Special Agent Hoover ever hired. I say this is a mystery because my research has not revealed any reason for Hoover to make this single appointment. As with Donovan and Duckstein, Hoover asked for and received Lenore’s resignation. Lenore resigned on November 7, 1928. It wasn’t until two weeks after Hoover died in 1972, during his 48th year as FBI Director, that females were allowed to apply for the position of Special Agent. In 1972, the first two female agents to attend New Agent’s Training Class were Susan Lynn Roley, a former U.S. Marine Corps Lieutenant and Joanne Pierce, a former nun. 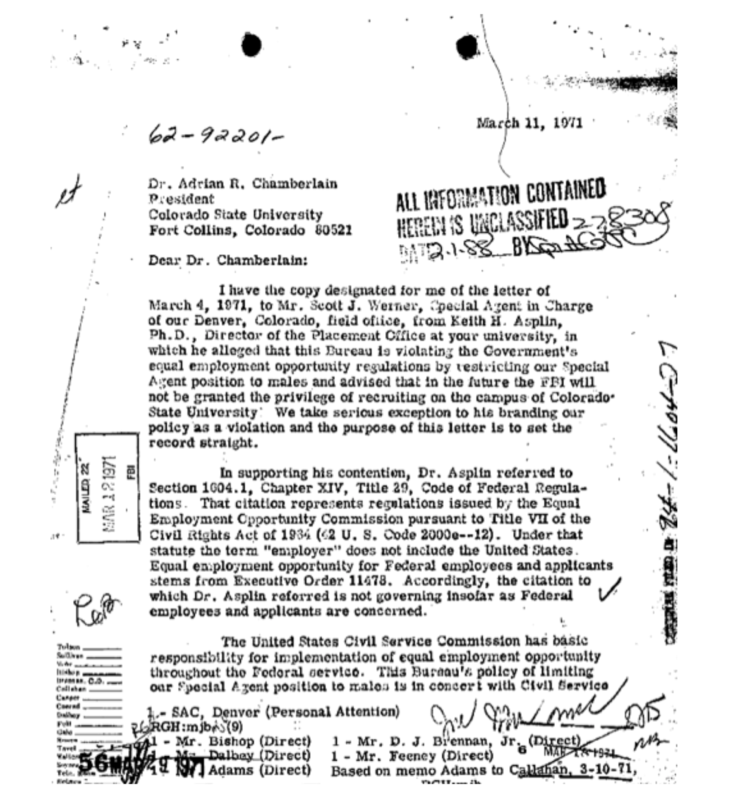 Here is a letter Hoover wrote in 1971 in response to a letter the FBI received from Colorado State University accusing the FBI of violating equal employment opportunity regulations by not hiring females as FBI agents. Because the FBI refused to hire female Special Agents, Colorado State University banned the FBI from recruiting on their campus.